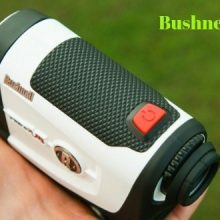 →Bushnell Tour V4 Jolt Golf Laser Rangefinder Review. Range: 5-1000 yards; 400+ yards to a flag. 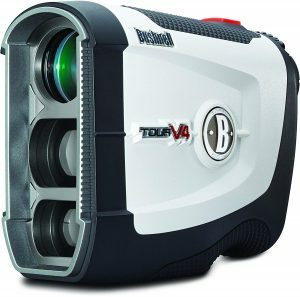 This fantastic Bushnell Tour V4 is allocating the most evident and unique features in it for which it is ruling the golfers’ collection. More focused on your game with the bushnell Bushnell Tour V4 rangefinder .It is one of the best laser rangefinders along with other important traits. You can rely on its service and use it for the proper results which you may not find in another golf rangefinder. From the experience of users, it is seen that the use of rangefinder is very simple and accurate.this product perfect for size , speed, accuracy and technology. its high-quality laser with <0.5mW average power output. Bushnell Tour V4 packs excellent features into a smaller compact form. The modified pin seeker with jolt technology providing short vibration. Fantastic range accuracy and 5x magnification. the 3 volt cr2 battery. Why should you choose Bushnell Tour V4 Jolt Golf Laser Rangefinder? Accurate Range- Bushnell Tour V4 correctly ranges 400+ yards within one yard to a flag, and it also ranges from 5 to 1000 yards. Sometimes environmental condition is Causes a slight variation. The maximum distance for the most objects are 640 meters and good weather and highly reflector objects is 914 meters. Pin Seeker with advanced jolt technology- the jolt technology will give you a short vibrating pulse to reinforce the laser onto the flag. Press the POWER button to turn on .Many users complain that sometimes jolt does not work everytime,It's a complete wrong. 5x magnification feature- Bushnell Tour V4 will provide you with 5x magnification which will let you observe the shot. What is interesting about Bushnell Tour V4 Jolt Golf Laser Rangefinder? ​Bushnell’s patented slope technology gives compensated distance depending on the hotel's incline or decline. ​It is Pro certified and legal for the tournament by disabling the slope mode. ​ It includes a 2-year warranty, battery, and a premium carry case. Why did my rangefinder change from yards to meter? Ans: If you press the button for so long, the unit may off, and then you can change the setting. Make sure you go through the manual given with the rangefinder to know all the necessary settings. Can I find the range for something other than a flag? Say a goal post or something? Ans: Yes, you can find a range the distance before hazards like bunkers, structures, and trees. Is this a useful gadget for someone that has a mildly sharing hands? Ans: Yes, it is also suitable for them. For the best use, brace it on a cart. Ans: No, it is assembled in the Philippines, and the Bushnell headquarter is in Suresnes France. Does it vibrate when you lock in the target? Bushnell Tour V4 is a customer friendly golf rangefinder. Most of the golfers’ number choice is Bushnell Tour V4. those who use them are bound to fall in love. It has held its position in the market from the beginning, and its continuous advancement and keeping up with customers’ necessity have strengthened its value more than any other competitor.